When a child is going through a difficult time, it’s hard for a parent to know how to help. 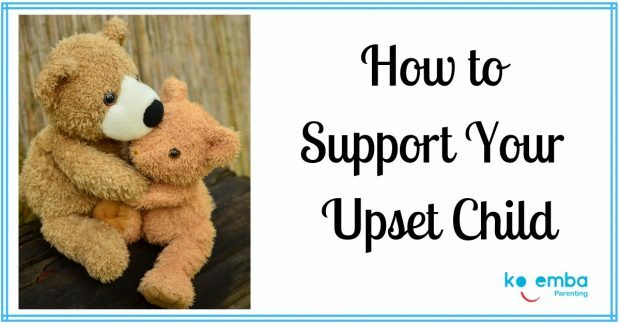 Here are five useful tips on how to support your upset child. What can a parent do! A key skill is to remain in “approach” mode. In every relationship the other person experiences us as being in “attack”, “avoid’ or “approach mode”. Samantha has been trying to stay in tune with her daughter over these past few days. She’s heard a deluge: I hate school, I haven’t got any friends, The teachers are stupid, Nobody cares. I don’t want to go to school. How does a parent respond! Samantha takes a long, deep pause trying to figure out what she’s going to say. But she doesn’t get a chance. “You’re just like them. You don’t care!” Her daughter slams out the room. “What did I do wrong!” Samantha is mystified. Samantha didn’t realise her child’s brain registered the long pause, followed by her heavy “BUT… ” as an “attack”. The thing is, it’s not what we intend that counts – it’s the message the other person receives that will influence the interaction. The thing is, when a child already feels overwhelmed it’s easy for them to misinterpret a parent’s signals and they can easily experience the parent as being in “attack” or “avoid” mode. This is only going to add to a child’s distress. Your child’s unreasonable outburst may be upsetting, but realise it is exactly that – “un-reason-able”. The behaviour stems from the child being “unable to reason” because at times of high stress the “thinking brain” temporarily goes offline. The child snaps into a “fight or flight” reaction. Samantha’s prolonged, heavy pause was all that was needed for her stressed child to experience her as another attacker. Right now the deep, reactive “reptilian brain” has seized control. It’s impossible for your child to reason once they have dropped into this reactive state. Until she’s calmed down, she IS un-reason-able! It won’t work to try help your child find solutions whilst upset because the human brain cannot see options and imagine consequences while the “thinking brain” is “offline”. 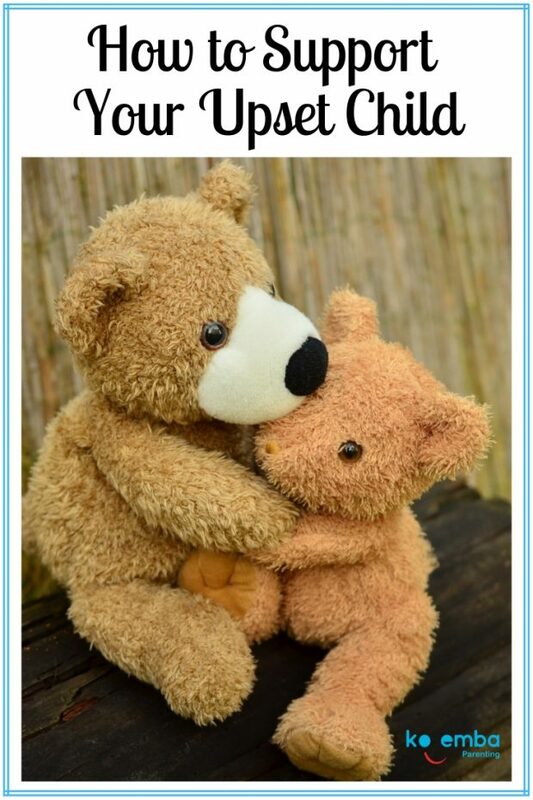 First connect and support your child to regain calm. At this moment it doesn’t feel like it will ever be all right again. She’s hurting and her reptilian brain is registering “PAIN!”, which means your child can’t see beyond that point until she regains her calm. Here earlier experience doesn’t negate what’s she’s feeling now. Somebody else’s experience isn’t hers. That’s like telling the cloud to stop raining. When this level of tension has been reached, the strong emotion will temporarily overwhelm. At this point, your child can’t see another point of view or imagine possible consequences to her actions until she has calmed down and returned to “whole brain thinking”. So don’t expend your energy trying to achieve the impossible! Staying calm is the only way to park your own anxiety and keep your “thinking brain” online. And this matters because there needs to be at least one thinking brain online to find the way through the current upset! For more on this see my e-book “Stop Yelling – 9 Steps to Calmer Happier Parenting”. If your brain is busy imagining the letter you will write to the teacher, what you’d like to say to those other kids, worrying that your child might drop out of school, then your brain is in another world and not focusing on your child’s world, which is where you can support her right now. There will be time to find solutions later. Right now focus on being present to your child and to her experience. Imagine crossing the bridge into her world experience and seeing the situation through her eyes. 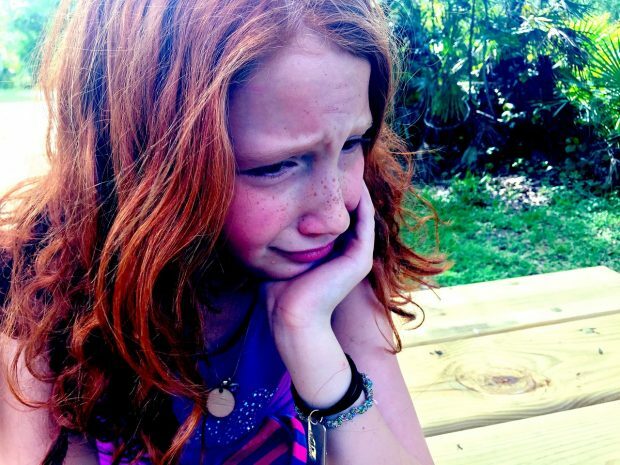 As you tune in to your child’s experience seek to understand what she might be feeling. Anxious, lonely, angry, frustrated? Don’t try to “change” her feeling. Feelings are what feelings are. Once she has a sense of her life experience being understood and validated, she’ll sense you being in “approach” mode and then be able to calm down. (Even though that might not be immediate). (Not “Why?” questions – which tend to lead to blaming or excuse making). Explore the options together and support your child to recognise the factors within her control, because these are the only things she can change. How to Support Your Child If They Are Having Difficulty At School which gives the core principles of building TRUST in our parent-child relationship. If you are facing a challenging situation concerning your child, why not work with me as your Parenting Coach. I can help you tune in to your child so you are in a grounded space to support your child to create collaborative solutions. I’d love to hear your experiences about how to calm your upset child. 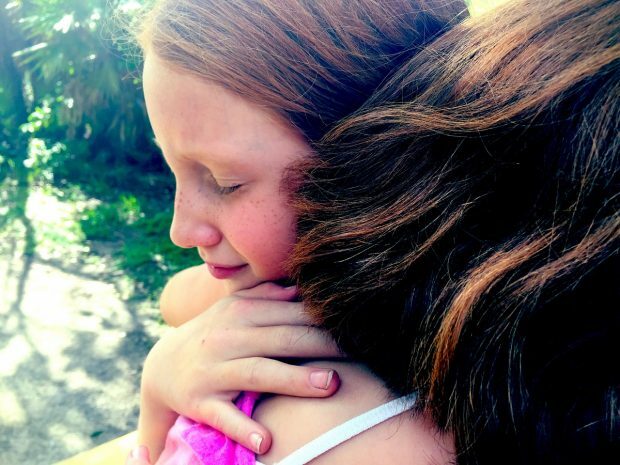 What has helped you to support your child when they are upset? 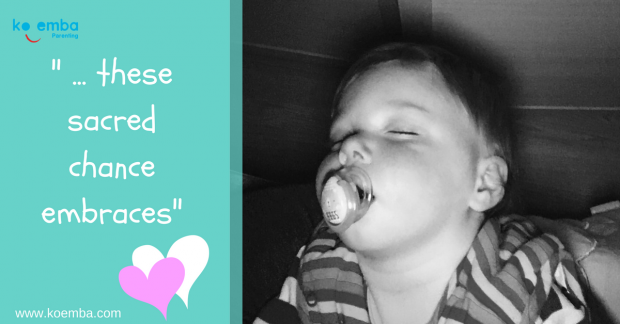 What is your greatest challenge in supporting your child through a difficult experience? Your answers help me to create the posts you’d love to read. Shopping lists. Last minute tasks to complete. Another card you forgot to send! 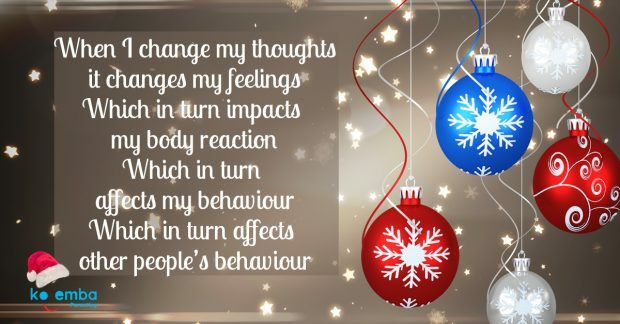 Here is how to stop the mind spin, how to stress less and enjoy Christmas. Yes, sometimes sad and bad things do happen at Christmas, but how we think about the situation can add to our stress or diminish it. Don’t you sometimes wish you could let go the Christmas stress and just relax and enjoy? The thoughts we tell ourselves add to our stress. We can ease the stress by noticing our thoughts, because negative, self-defeating thoughts erode our sense of well-being. It’s often not so much the circumstances that stress us – it’s our thoughts about the situation. “But aren’t our thoughts our thoughts?” you may be asking. 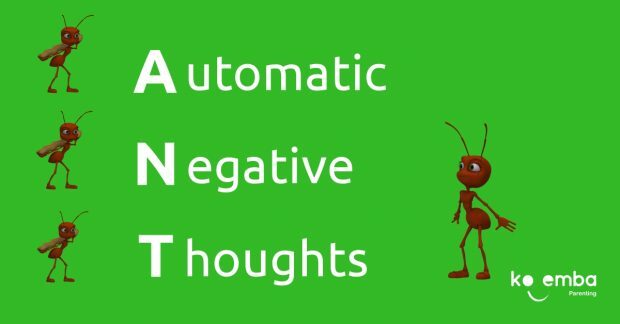 We often have ANTs – Automatic Negative Thoughts. ANTs are thoughts that jump into our heads – that we often react to without assessing them. Negative thoughts can make us reactive, which can cause the other person to react. So our thoughts become self-fulfilling. The good news is we can change our thoughts, when we are aware. Notice what you are actually saying. Is it 100% true all the time? Is this thought helpful or is it winding you up? To let go of unhelpful thoughts, first we need to recognise them. Can you spot any of these in your own thought patterns? We presume we can read the other person’s mind. We think we know their intentions are “bad” or uncooperative. We predict the worst-case scenario outcomes. Acknowledge that thought is not true. Consciously rephrase the thought to something that builds hope. These words add to our stress and disempower us. Whenever we notice those words and test the truth of our thoughts, it can help us to gain a more realistic and helpful viewpoint. “Always late?” If the thought is not true 100% of the time, then it’s not true. What would be more accurate? “He’s often late” or “He’s sometimes late”. Change your words for something that reduces your stress. These “guilt” ANTs need careful testing. “I ought to be kinder to myself” – probably yes. “I ought to be doing more” – probably no! “Guilt” ants make us feel stressed. Test to see if this guilt causes s a vague thought that just unsettles you without creating any helpful outcome, or if it’s nudging you to take helpful constructive action. We pass judgement on ourselves and on others, causing a sense of comparison and stress, often leading to unhappiness. Unless you’re talking about a legal or ethical issue, where there is a defintive right or wrong, recognise that the strong line of “right” or “wrong” is generally stressful. Find words that are more helpful. Perhaps reword your thought as a question. What happens when you view the situation with compassionate curiosity? What is the impact of my thoughts on myself and on others? 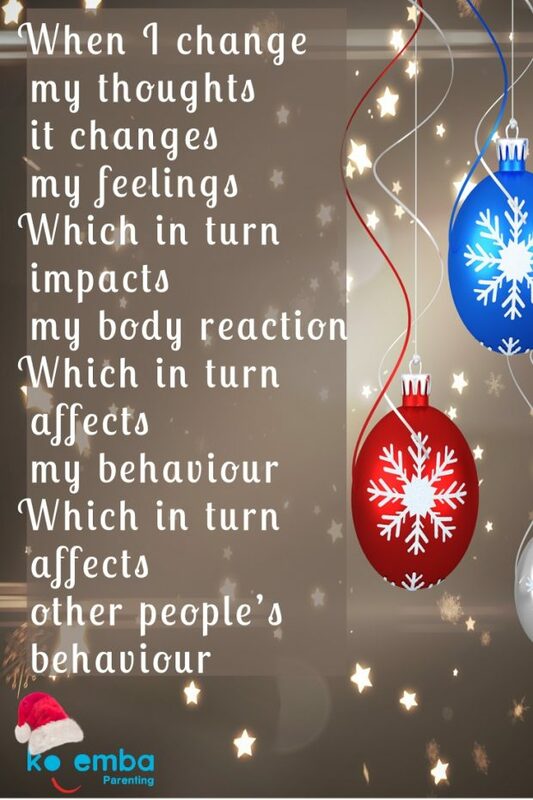 Which in turn affects other people’s behaviour. It’s not that we won’t still have difficult situations to face. It’s how we respond to them, rather than negatively react to them, that can lower our stress levels. M is for Mindfulness in the next blog in this CHRISTMAS series. What ANTs do you spot in your inner talk? Try rephrasing any ANT you spot with words that reduce your stress. Notice the impact this has on your reactivity and on others. 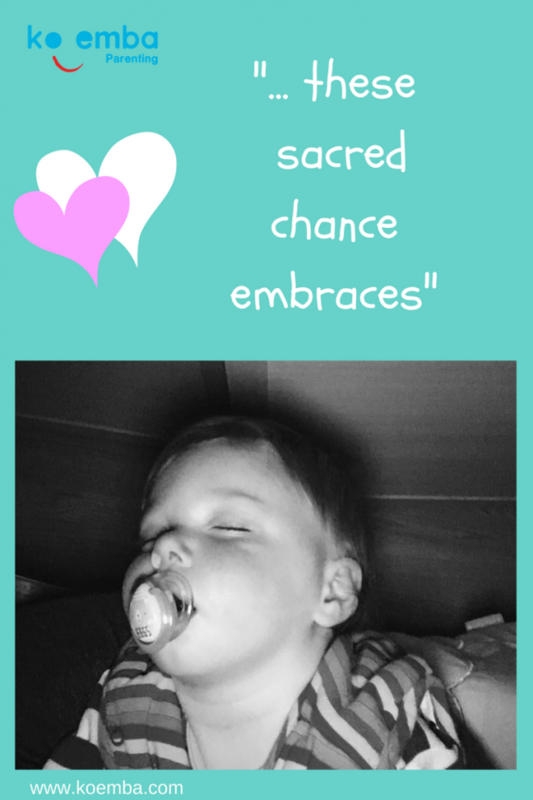 Parenting Course in Douglas, Cork – Last chance to join! Our Koemba ‘Deepen Connection and Communication with Your Child’ course in Cork, facilitated by Parenting Expert and author Val Mullally has had their introductory evening. There’s still time to join the course, but HURRY! Last entered accepted only till this Thursday (14 April). Your doorway to Mindful Parenting. Click the live link to discover more about this Parenting Progamme that could help you have a happier, calmer family within weeks. ‘BEHAVE – What To Do When Your chid Won’t’ Parenting Workshop facilitated by Val Mullally and hosted by Dún Laoghaire Rathdown Childcare. 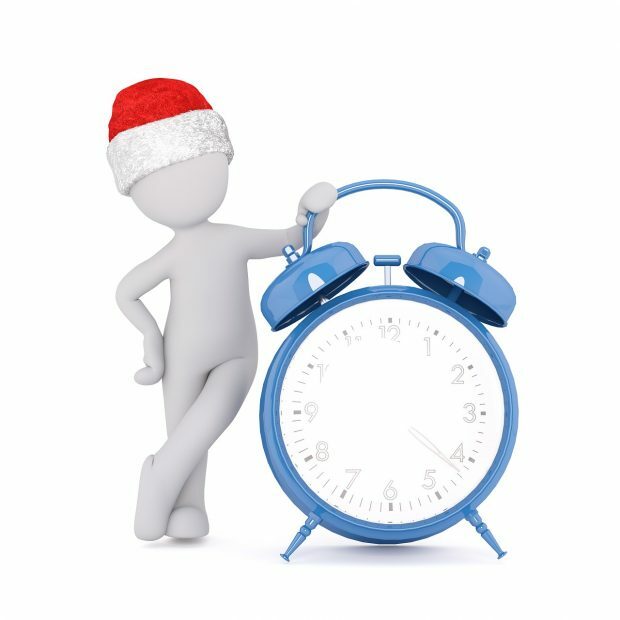 10am – 12:30 Saturday 14 November. ‘How will I ever lose weight!’ You know, and I know, the festive season is hardly good for losing centimetres around your waist, or your rear end, but you are determined to get off to a good start with healthy eating in the New Year. You may be wondering why I’m writing about weight loss when my work is as a Parenting expert. (I see myself as an expert on helping you to be the expert in what your family needs to thrive). Last January I was asked to postpone a Parenting workshop. ‘It seems people aren’t ready to get going till February’, the lady from the hosting organisation explained. If you as parent are stressed it tends to increase every family member’s stress, and so we all get caught in a downward spiral that easily skids out of control (weight included!) And if you think about it, our stress is largely related to anxiety; wondering how we’ll cope. And Anxiety is something we can do something about, if we know how. ‘Anxiety = Powerlessness x Uncertainty’ according to Chip Conley in ‘Emotional Equations’. So imagine if you knew how to increase your sense of Power to create a calmer home. Imagine if you could increase your sense of Certainty of what your children need to thrive. A greater sense of personal Power and a Certainty of what matters and what to do about it = Less Anxiety = Less Stress. And less stress is likely to result is becoming the calmer, happier, slimmer, fitter parent you really want to be. This is only theory, but if it makes sense to you, why not discover the Koemba coaching approach to Parenting? This is a combination of my experience working with children and parents as a teacher and school principal, what I learnt though having children of my own, combined with Life Coaching skills and practical communication tools and key insights from Relationship theory. Following on from the success of my ‘BEHAVE!’ Parenting course, my new ‘LISTEN!’ Parenting programme starts in Cork and also in Kilkenny this February. Want to know more? Take two minutes to watch our video clip, on the side panel. Sign up now to save €20 with the Early Bird option. If you’re not lucky enough to be in those geographical regions, keep watching our posts because we have exciting developments to launch new Parenting resources.